Ladies and Gentlemen, welcome to the very first giveaway here at Money Is The Root. I predict this giveaway to be the first of many more to come. 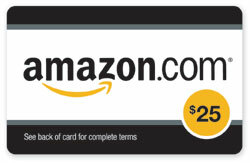 Our first giveaway item is going to be a $25 gift card to Amazon.com, which is great because you can buy literally anything there. For each of these methods, it is important that you place a comment below the giveaway post stating each action you took. Leave a comment after you “like” MITR on Facebook, and place another comment stating that you are now following MITR on Twitter, or that you now subscribe to the blog. Each one of these actions needs to be listed in a separate comment. If you already subscribe, follow on Twitter, or Like MITR on Facebook, simply note that in the comments section and you will receive an entry for each one as well. You must complete all entries prior to 11:59 PM Eastern Time the night of June 8, 2011. The winner of the giveway will notified by email on Thursday, June 9, 2011. The winner will have 3 days to contact me via email/contact form and accept the prize, otherwise there will be a redraw for a new winner.